While doing research on WWII propaganda posters I came across this poster for the American Chocolate Fund. I knew it HAD to be included in a painting. The American Chocolate fund’s goal was to send 1000 pounds of chocolate EACH WEEK(!) to the American Expeditionary Forces in France. Wow! 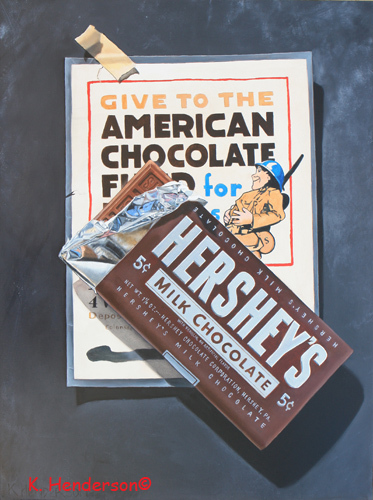 This Trompe L’oeil includes the poster along with a Hershey’s Chocolate Bar in a World War II era wrapper. This is another in my Cocktail series. 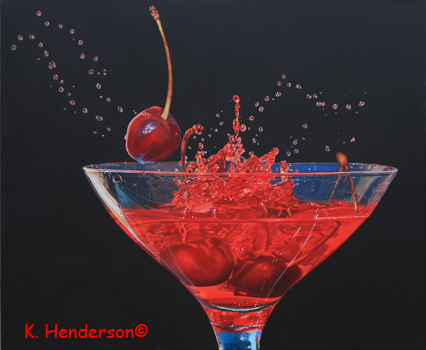 I wanted to paint a red cocktail with cherries and this is the results. I love licorice! Any kind, any where, any time. Allsorts is my favorite. Not only is it tasty but it’s also beautiful. It’s truly Eye Candy. I enjoyed painting the glass lid. 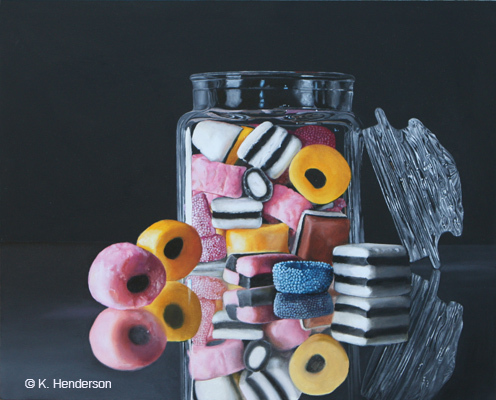 The abstract shapes of the reflections and highlights made it a real challenge. 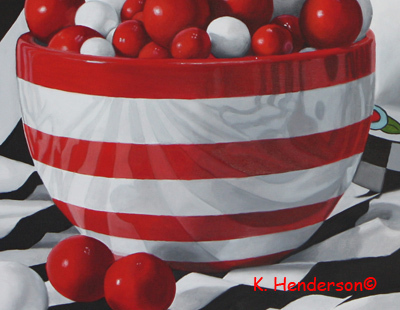 This is another in my series of striped paintings. 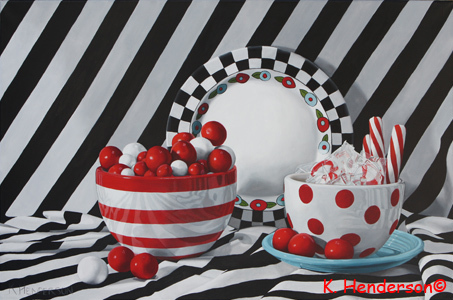 Here is a striped bowl with gumballs and a polka dot bowl with peppermints. I got this plate at a thrift store and I believe it is handmade. “Oreo” was first trademarked in 1912. And the rest is history! 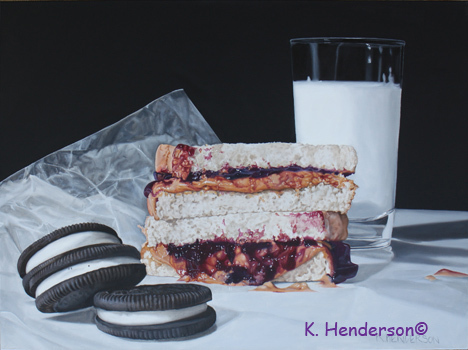 Grab a glass of milk and enjoy an Oreo today. Today is National Puzzle Day. Basic puzzle: pieces are intended to be put together in a logical way in order to come up with the desired solution. British engraver and mapmaker, John Spilsbury, created the first jigsaw puzzle in 1700 when he mounted a map on a sheet of wood which he then sawed around each individual country. Spilsbury used his product to aid in teaching geography. My Batman Puzzle was manufactured by Milton Bradley in 1966. 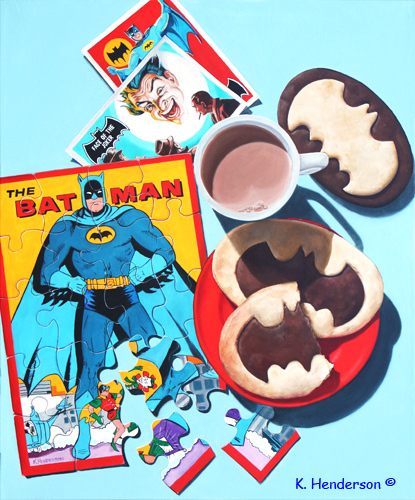 The Batman Cookies (also a puzzle since they are pieces put together in a logical way) were baked by me last week. 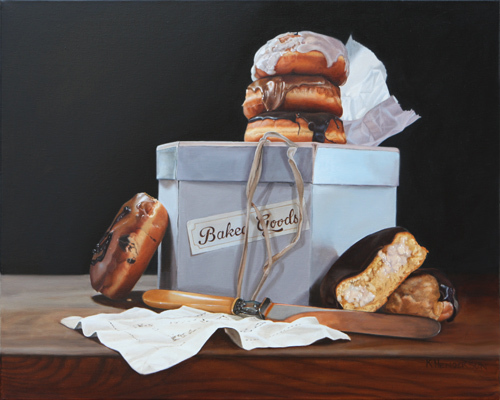 This oil painting is the end result. Don’t forget. 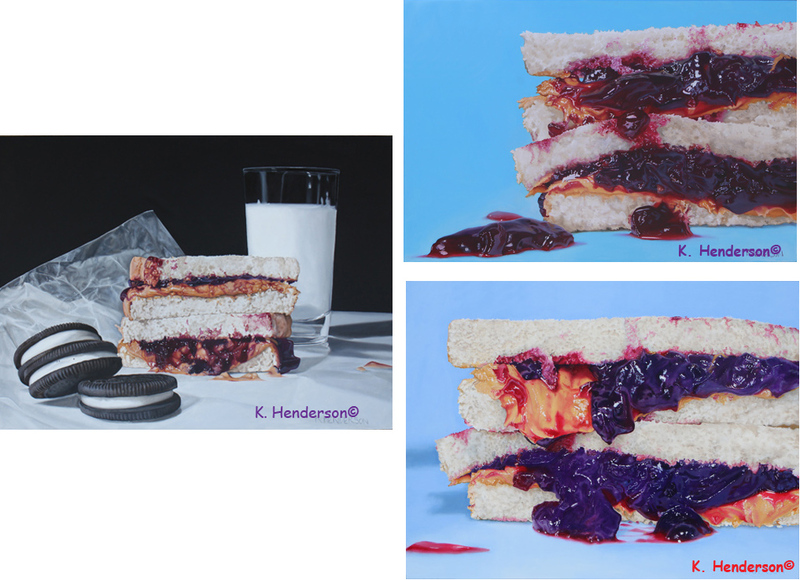 The International Guild of Realism (IGOR) 8th annual exhibition is coming up. The show dates are October 5 – November 30, 2013.